Pawn shops are affected by fluctuating gold prices due to the fact that many buy gold outright and have jewelry as stock. Gold prices aveeraged $1722/oz in November, bringing the fourth quarter-to-date average price to $1735, which is up 2.9% vs 4Q11 average price of $1,686. Gold prices are acting as a tailwind for pawns right now, but volumes are also important to pay attention to. 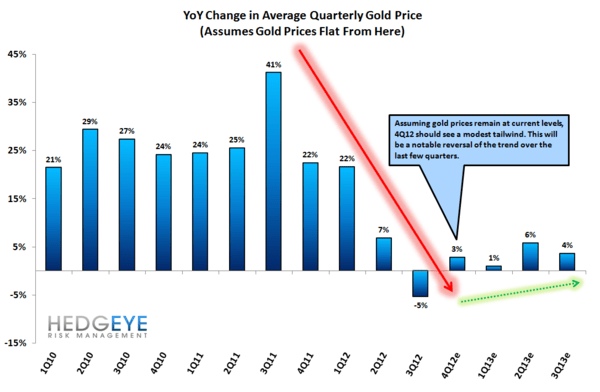 Same store gold volumes have been falling in the high teens at the year-over-year rate over the last few quarters. Rising prices do help a little but not enough to outweigh declining volumes. Who’s affected by the decline in volume the most? EZ CORP (EZPW) and Cash America (CSH) have been the hardest hit while First Cash Financial Services (FCFS) and DFC Global (DLLR) are faring well on their own. 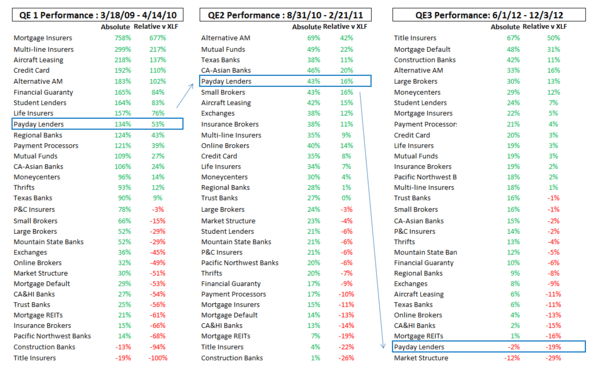 We are bearish on EZPW and CSH and bullish on FCFS and DLLR.